A trailer has been released for Holidays, the new holiday themed horror anthology flick we found out about a little over a year ago. The movie features a list of directors including Kevin Smith, who was known for his work in the realms of comedy before jumping over to horror with movies like Red State, Tusk, and the upcoming Yoga Hosers, and who got the prime Halloween holiday to work on here. Other directors include Gary Shore (Dracula Untold), who takes on St. Patrick’s Day; Adam Egypt Mortimer (Some Kind of Hate), who gets New Year’s; Dennis Widmyer and Kevin Kolsch (Starry Eyes) with the lovers’ holiday Valentine’s Day; Scott Stewart (Dark Skies) delivering the Christmas segment; Nick McCarthy (The Pact), who gets Easter; Sarah Adina Smith (The Midnight Swim) grabs Mother’s Day; and finally Anthony Scott Burns (Manifold) with Father’s Day. 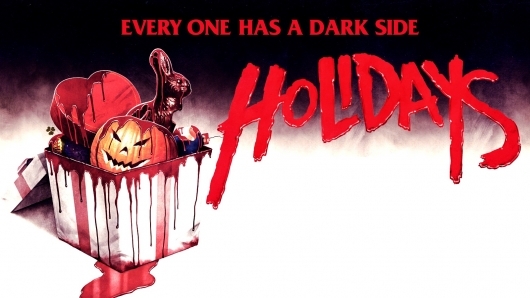 Click on over to the other side to check out the trailer for Holidays.